seigneur de la Ravardière discovers area. Maranhão, Brazil before being expelled. 1620 - 1620 Attempted English settlement at Oyapock. 1623 - 1624 French establish a trading post at Sinnamary. 1637 French establish a trading post at Cayenne. Compagnie de Rouen to 27 Dec 1653). 14 Jun 1645 - Nov 1645 Abandoned. Dec 1645 - 21 Mar 1652 Abandoned. 27 Dec 1653 - 15 May 1664 Dutch occupation. the Compagnie de la France Équinoxiale to 1674). 23 Sep 1667 - 8 Oct 1667 English occupation. 5 May 1676 - 20 Dec 1676 Dutch occupation. the governor of Pará province). 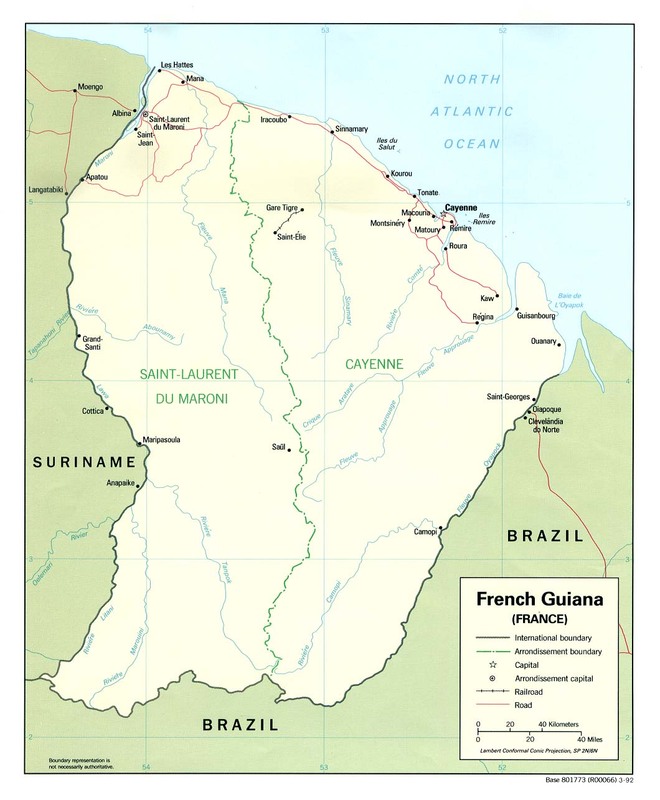 8 Nov 1817 French Guiana (Guyane Française) restored to France. 1852 - 22 Aug 1953 Penal colony on Île du Diable (Devil's Island). of the Theater Atlantic West (see Martinique). (from 18 Mar 1943, under Free French). the governor as French Guiana. 19 Mar 1946 French overseas département (previously colony). 28 Mar 2003 French overseas region. 10 Jan 2010 Referendum votes 70.22% against increased autonomy. (both headwaters of the Lawa) in French Guiana. 14 Sep 1951 Inini is declared an arrondissement of French Guiana. 22 May 1604 - 1605 English under Charles Leigh attempt a settlement at "Wiapogo"
1620 - 1620 Attempted English settlement at Oyapock (on the River "Wiapica").